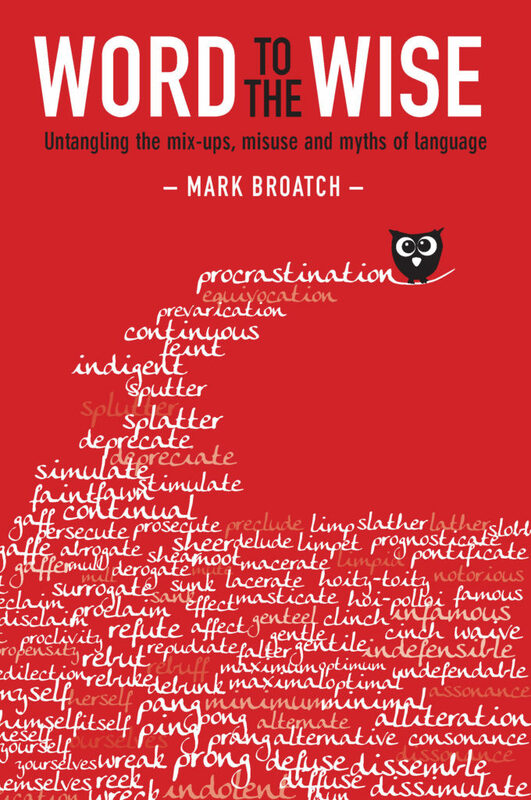 It is not usually my practice to comment on a new book in this “Something Thoughtful” section, but Exisle Publishers recently sent me a copy of Mark Broatch’s enjoyable Word to the Wise ($NZ 25:99) and I thought I could be sneaky and comment on it here, as it deals with matters upon which I have frequently expressed opinions – viz. matters of language and correct (or at least acceptable) usage. There are many old favourites here. I believe they would confuse few people with more than a rudimentary knowledge of English, but they could confuse people just beginning to learn English. “Comprise” / “compose”. “Dual” / “duel”. “Immanent” / “imminent”. “Imply” / “infer”. “Sewage” / “sewerage”. “Luxurious” / “luxuriant”. “Metal” / “mettle. “Alter” / “altar”. “Pray” / “prey”. And surely only the hoi-polloi would confuse “hoi polloi” with “hoity-toity”. I really do wonder which people would confuse the following pairs, all included by Broatch: “Acrimony” and “alimony”. “Eccentric” and “eclectic”. “Miasma” and “milieu”. “Malinger” and “philander”. “Emancipated” and “emasculated”. “Ersatz” and “erstwhile”. Really, how often have these words been misused, one for the other? Has Broatch included them simply for the fun of it? And even if they understood the meaning of either, in what circumstances have people misused “iatrogenic” in place of “idiopathic”? Some of the mistakes Broatch points out are cases of sheer illiteracy, the perpetrators of which will one day face the severest penalties when they are brought before my Court of Linguistic Correctness. (“Bias” instead of “biased”; “brought” instead of “bought” etc.). I am not sure that Broatch’s exposition concerning the correct uses of “that” and “which” really clarifies matters; and I am still unsure how to distinguish “predilection”, “proclivity” and “propensity”, even after his definition of each. He does raise some issues I’d never considered, such as the American and the British uses of “backward’ and “backwards”; and I was unaware that Americans are apparently adopting the habit of using “nonplussed” to mean “indifferent” or “bored”. I am quite nonplussed by this information. So to a list of controversial matters raised and my responses to them. On the “alright” and “all right” controversy, I would say that the two forms now have two different meanings and the form “alright” should be accepted – even if one of my publishers once insisted that I turn my “alrights” into “all rights”. As for “crapulence” and its derivatives – I would either reserve them for drunkenness or not use them at all (Broatch rightly notes that they are often used wrongly). In the same way, I insist that “noisome” means smelly rather than noisy (although, of course, a fart can be both). I agree with Broatch that we must uphold the difference in meaning between “uninterested” and “disinterested”. People who confuse these words will be executed after trial in my Court of Linguistic Correctness. Unlike Broatch, however, I would return “crescendo” to meaning a gradual increase in sound, and not the final climactic blare. Likewise, I would rein in the use of “decimate”. I oppose the gradual “creep” in this word toward being a synonym for general destruction. Even if (as Broatch says) we no longer punish every tenth soldier, the word still means to sustain serious, but not decisive, losses. A decimated army is still an army that can offer battle. I differ from Boatch in that I would always use “different from” and I regard “different than” or “different to” as illiteracies. I would be wary of using “enormity” in such a way as to suggest that it refers to size. 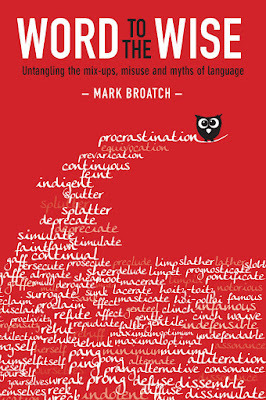 I am pleased to see that Broatch cautions against using “less” when you mean “fewer”, but my Linguistic Agents are now classifying him as a Person Of Interest for endorsing the loose use of adverbs such as “hopefully”, for encouraging the use of “impact” as a transitive verb and for defending the non-literal use of “literally”. I further caution that my hired investigators will soon be purging the staff of the OED (cited by Broatch) who suggest that the absolute term “unique” can be modified with words such as “very” or “quite”. Finally, if you are going to include a definition of “Procrustean”, why not include a definition “Draconian” [as the two terms both fall refer to great severity]? I should note that Broatch ends his volume with lists of words often mispelled (or misspelt), common social media abbreviations, unusual plural forms and clichés. I should also note that he has a tendency to label (in both his introduction and his text) more fastidious users of English as “traditionalists”, but then he is manifestly not an advocate of a linguistic free-for-all. If he were, he would not compose a book such as this one. Likewise he often labels as “literary” words, such as “erstwhile”, that are only a short distance from everyday speech. Kingsley Amis’ enjoyable style-guide The Kings English is labelled by Broatch as “archly sticklerish”. This is ironic because I have now placed Broatch’s Word to the Wise on my shleves next to my copy of The King’s English. We all know how annoying it can be when people question our own use of language. Recently, a reader called me to account for referring, in a book review, to people as “straight-laced” ( = correct, proper, perhaps prudish). The reader pointed out that it was spelled correctly “strait-laced”, and gave an etymology of the phrase to prove his point. I did a little research and found that the etymology is disputed and the term may legitimately be spelled either way. Likewise I remember once how annoyed a journalist became when a reader called him out for using the phrase “begging the question” as if it were a mere synonym for “raising the question”. (To “beg the question” means to assume the truth of an argument without proving it, usually by circular reasoning). Some matters to do with grammar and the correct use of words will always raise eyebrows and controversy. This status quo prevails even after reading Word to the Wise. But it is enjoyable to canter through it, and it will be of help to many. For the record, you may find on this blog my own opinionated witterings about language and usage in earlier postings here Awareness of Language and How to Diminish It and here Grumpy Old Man Mode and here Passionate Impacts on your Behalf and here Um.